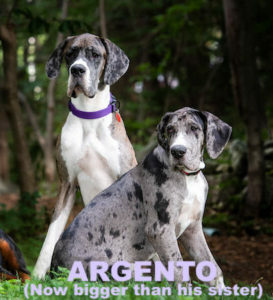 Additional Notes: Argento will be 1 Yr old next week. Add about 80lbs to the photo and he is now taller than the other Dane in the photo. He is micro-chipped and has a very distinctive identifier mark. He may be shy, but he loves treats. Please report any sightings immediately. Do not chase…it may be best to call his family as soon as he is sighted, rather than scaring him farther away by trying to approach. Any help is appreciated. His family is just sick that he is missing… please share his info. Additional Notes: FEMALE: Husky mix, 5 years old, black and tan coat, wearing a bright pink collar. 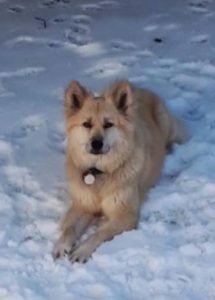 NAME: Mia FEMALE: Husky mix, 4 years old, grey and fawn coat, wearing a bright orange collar. NAME: Lexie Both went missing on April 22/19. NOTE: Both are tethered together. 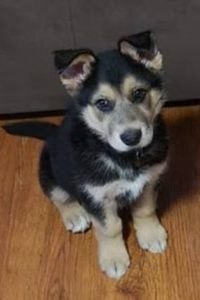 Additional Notes: MALE: German Shepherd/ Husky mix, 10 weeks old, black, tan and white coat, white blaze on chest, white tips on paws, wearing a collar with tag. NAME: Rebel He went missing on April 9/19. Collar/Tags: No collar – slipped out of collar when we let him out of the vehicle. Additional Notes: We had just gotten this dog from a breeder and were travelling back to Halifax. On the way home the dog got car sick, so we let him outside to get some fresh air. We stopped on the side of the highway 101, between exits 25 and 26. The breeder told us he wasn’t very comfortable in cars. When we tried to guide him back into the car, he slipped out of his collar. He ran down the highway (did not get hit) but then ran into the woods. Claudius is fairly small – he is around 14 lbs and has a black, shiny coat. He has thick fur around the neck. He has brown eyes. His face is similar to a fox. He is speedy, and is used to being in a gated yard. He ran into the woods around 7PM. We looked for him until 9PM. We are originally from Halifax but staying in a B&B. He is microchipped, and the police are aware he is lost. Please bring him to the police or vet if you find him. 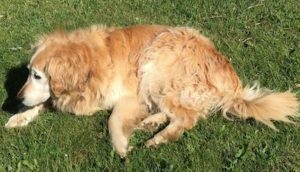 We have just currently lost our other dog due to health issues and old age – it would be unbearable to loose another dog so soon. Additional Notes: FEMALE: Dachshund, 12 years old, long haired, tan with dark shading, wearing a red and yellow collar, no tags, with numbers embroidered on collar, microchip. 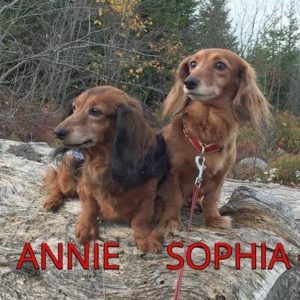 NAME: Annie FEMALE: Dachshund, 7 years old, long haired,tan coat with light shading around muzzle, wearing a blue and red collar, phone number embroidered, no tags, microchip. NAME: Sophia BOTH went missing on March 27/19. Additional Notes: MALE: AmStaff mix, 3 years old, black and white coat, white blaze on neck and chest, white socks, white stripe on right side of nose, not wearing a collar. 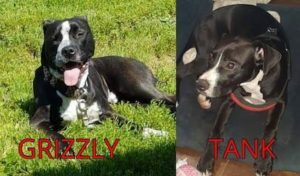 NAME: Grizzly MALE: AmStaff mix, 8 months old, black and white coat, white on muzzle, white tips on toes, white blaze on chest. 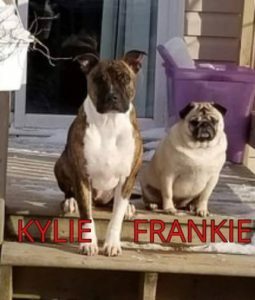 NAME: Tank Both went missing on March 27/19.